modern quilting | Told You Sew! Send me a comment if you have any thoughts on how to improve these! 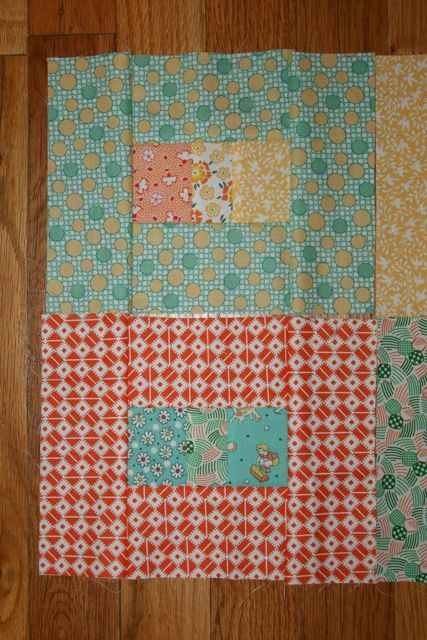 I am seriously considering removing the strips of apricot and white, but then, I could go even farther and totally redo the blocks to make them more consistently orange. My previous post showcased the red and yellow versions of these, which I think worked better together. More soon as I meditate this, if I find a few minutes to sew in this busy life. Happy almost-spring! I have been busy! Very, very busy, and although most of my busy-ness hasn’t been focused on crafting, I have had a few inspirations and I’d like to share those with you. My theme? 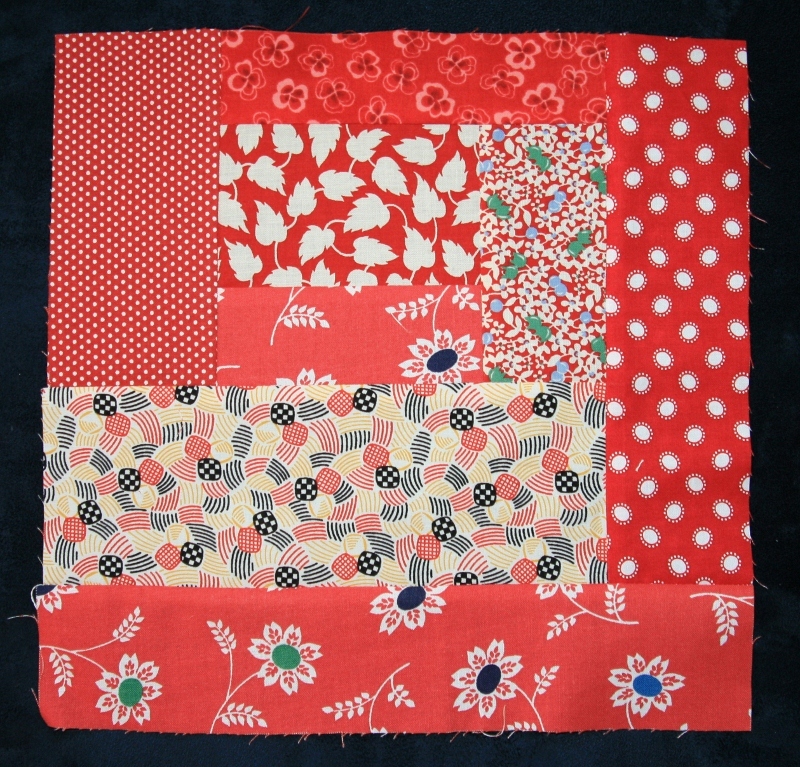 Vintage modern patchwork. I’ve become obsessed with the book Sunday Morning Quilts, which is such a fun, joyful approach to patchwork and quilt-making for those of us who’d like to use modern techniques to make arty, pretty quilts. 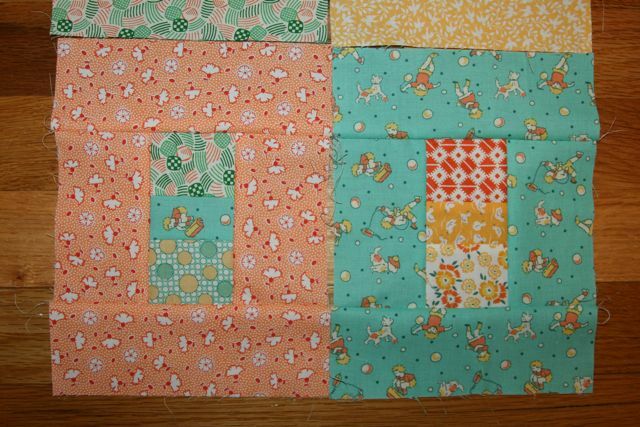 The authors focus on improvising with scraps, first by dividing them into colors, and then by turning them into “slabs” – blocks of make-your-own patchwork fabric that sort of resemble log cabin block. Really, they could be any sort of rectangle/square creation you could dream up. 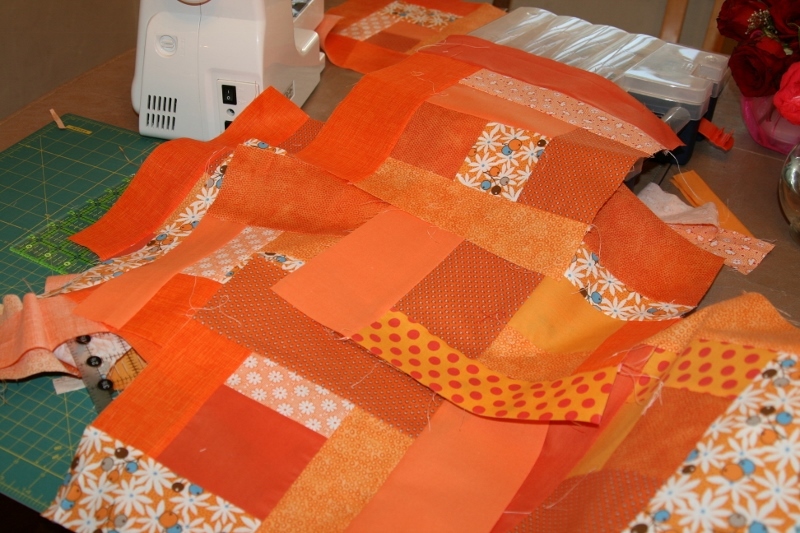 If you have strips or scraps on hand, and love putting color on top of color, it can be addictive. 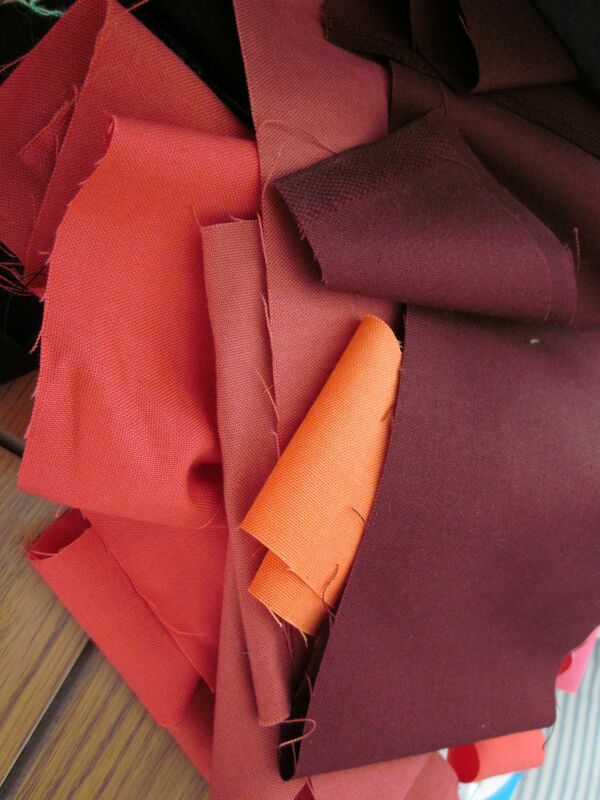 I’m now making “slabs” in red and yellow. I am still drawn to 1930s/40s reproduction fabrics and modern fabrics that have a similar feel: tiny prints, polka dots, little florals that are mostly one color, all in very vibrant hues. My local quilt store provides me with both, luckily. 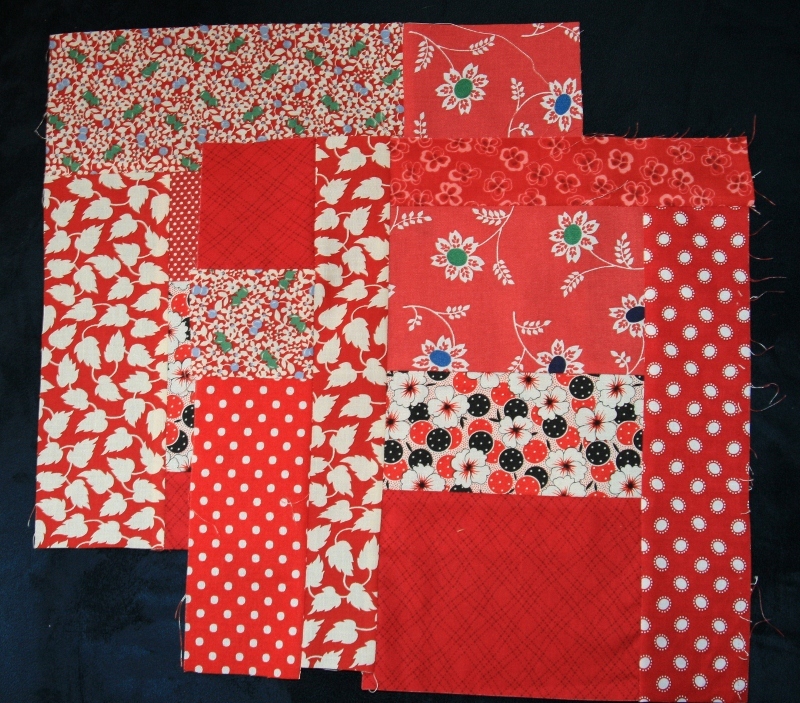 For me, it’s a kick to combine old-school fabrics that are just so bright and cheery with modern-style patchwork. 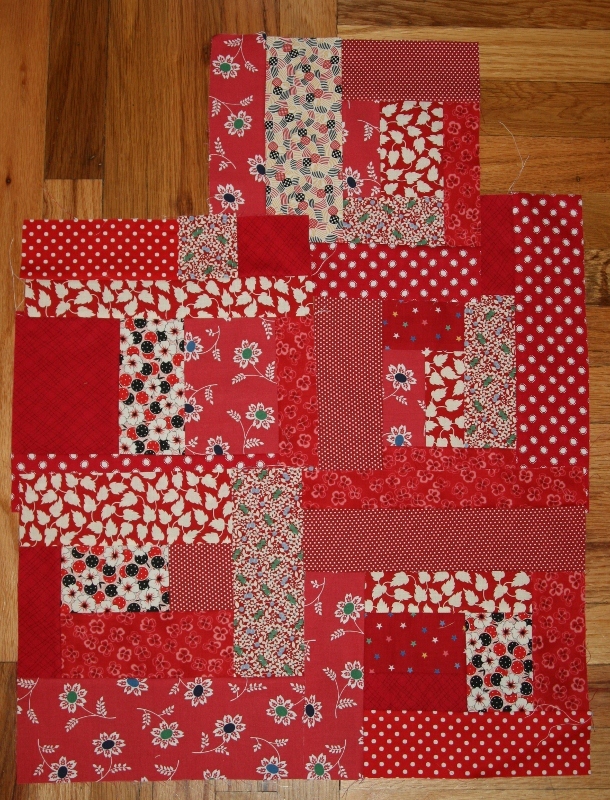 This is an example of what I did with strips of bright red. Next: I will trim these and stay-stitch them around the edges. Then: Orange slabs, and then slabs that are off-white with tiny little prints. I have a plan, believe me, for what to do with these… More on that soon. And stay tuned: in an upcoming post, I’ll show you my progress on the little holiday quilt featuring the tiny “mini” prints from my previous post. 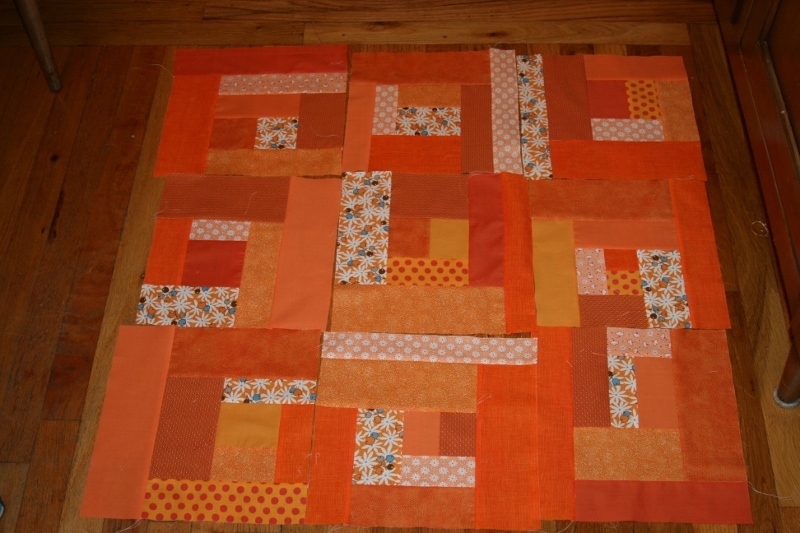 I’m making this quilt for a very special couple, one of whom just may be reading this. (This is a test, only a test… Comment if you’re there!) I couldn’t wait to share it, but it will be a wedding gift for her so I hope she’ll still act surprised and happy to receive it when it’s all done. 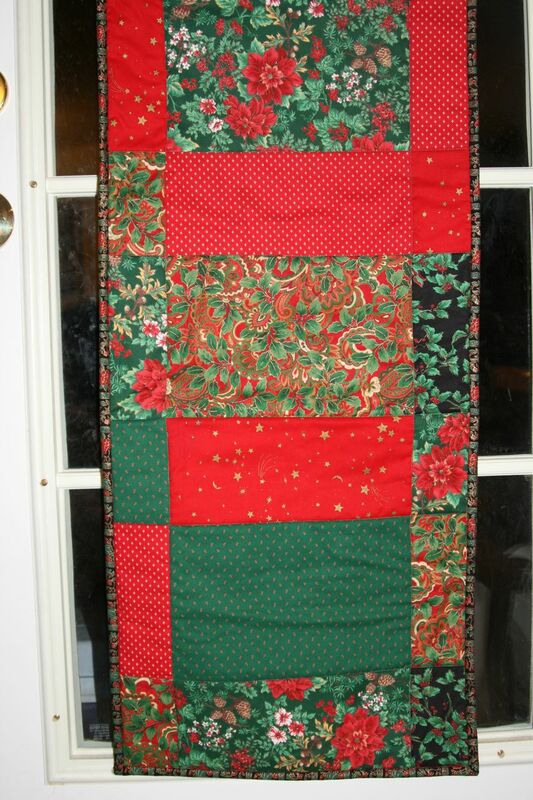 Right now it’s a fresh, 31-square-inch quilt top hanging on my door, which I seem to use as a lightbox. I call this “Woven Together” and I used some really pretty, rich batik charm squares and a straightforward, modern pattern from Gail Abeloe of Back Porch Fabrics, my favorite place in Pacific Grove (well, that and Lovers’ Point – where the view of Monterey Bay just can’t be topped). This palate makes me think of rain pouring over the “golden” hills of Northern California–rain we desperately need. I just heard that San Jose has had only a quarter of its expected rain by this time in the season. Perhaps this can serve as my personal rain dance. 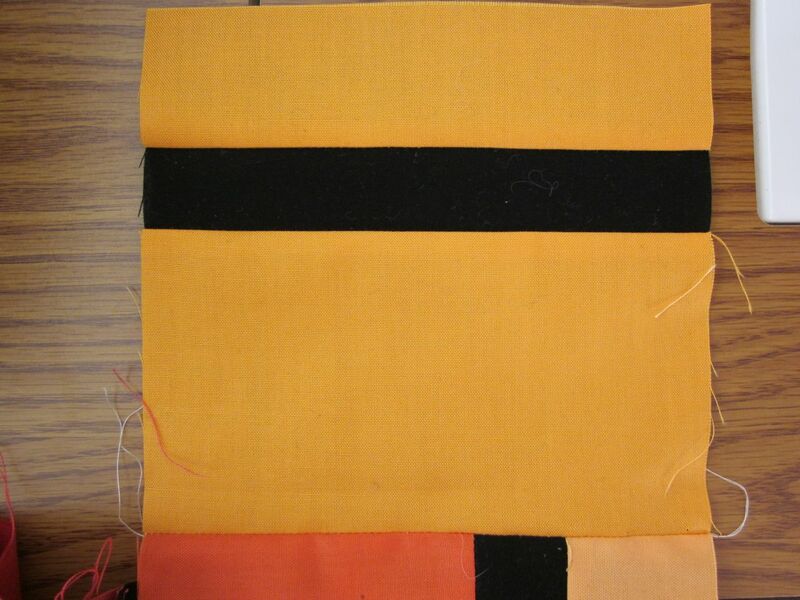 When it comes to fabric, I think I’m in love with the 1930s. These reproduction prints get me every time! Have you heard of a line of fabric called “quilter’s candy”? To me, that’s just what this is. 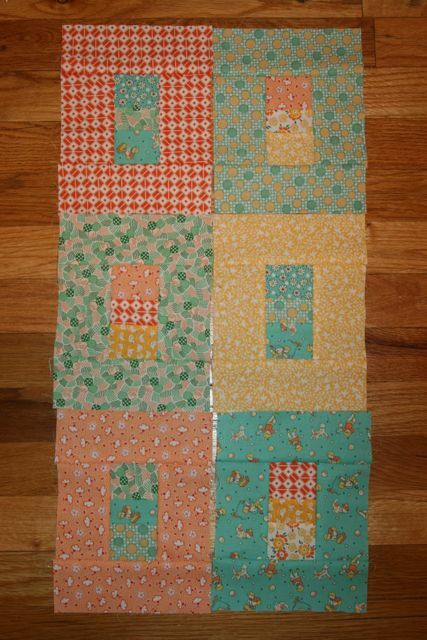 A sweet, delectable treat, one that thankfully doesn’t even add any inches to my waistline… I can’t get enough of these bright greens, oranges, and yellows, so I decided to start making them into a “modern” quilt, using a simple pattern from Cozy Modern Quilts (thanks to Carole for that book recommendation!). I’ve only done a few blocks but it’s super fun. 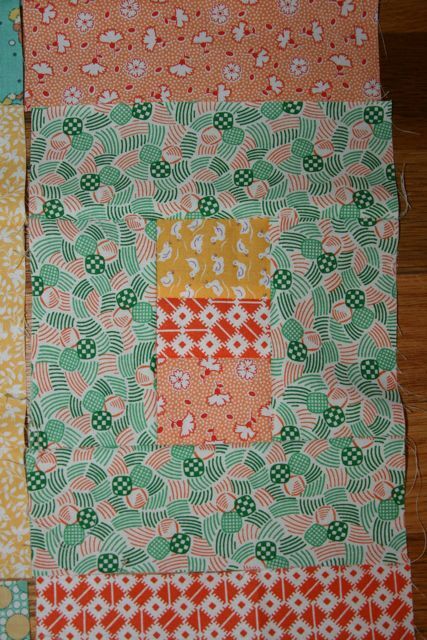 The geometric nature of these blocks lends itself well to tiny prints, I think. 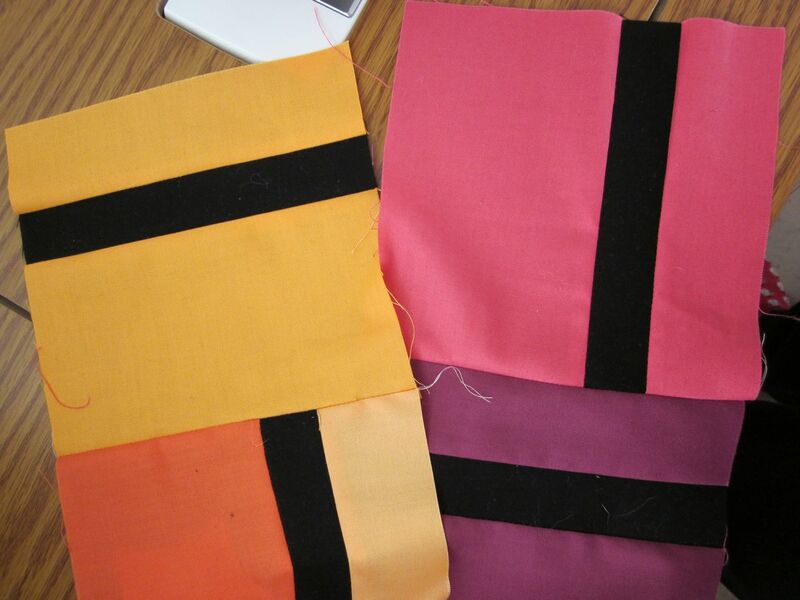 I purchased the bulk of these fabrics at a little shop in Chicago called Quiltology. I love that name, and its subtitle: “Chicago’s Urban Quilt Space.” It was featured on the TV version of Fons and Porter’s Love of Quilting in its old location. I visited its new shop in late March and took home a bundle of fun stuff. (It was one of my crafty souvenirs, which I now try to substitute for another t-shirt.) A woman shopping there assured me that these colors are “very modern.” That makes sense, since the shop focuses on contemporary designs. I get easily distracted these days by so many different commitments and projects, so I am not sure when I’ll be able to finish this, but it’s the type of project that could be built slowly, block by block, with scrappy fabric choices as I go along. 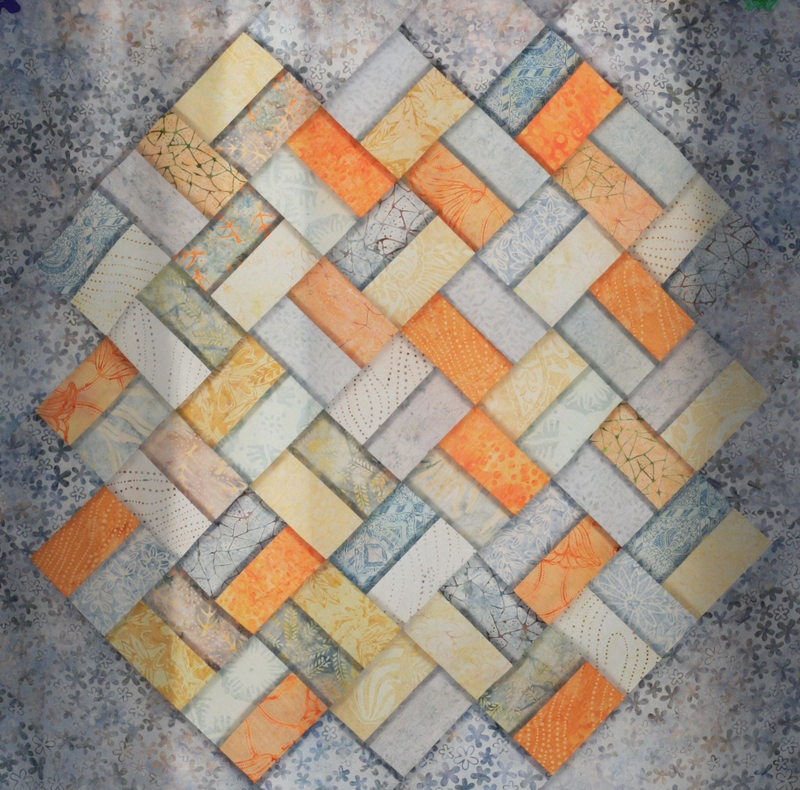 I found some cool links on Quiltology’s website that I’m now checking out. One of them is Blue Underground Studios, which produces contemporary quilting patterns. 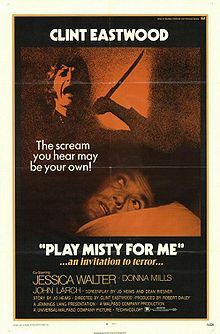 Looks very enticing! As I continue my creative work, I’m learning more about the importance of style. In my past life as a creative writer, I knew the styles I liked – my favorite was 19th-century fiction and poetry. I guess it is a little intimidating as a contemporary writer to hold your work up to Eliot, Dickens, Flaubert and Dostoevsky, or Baudelaire or Dickinson for that matter – though I still aspire to writing a novel of manners someday! Now, as I pursue fiber art, I find myself leaning more towards contemporary styles in my quilting and other crafting. I am moving into the modern era, finally, after many years of studying history and styles from the past. 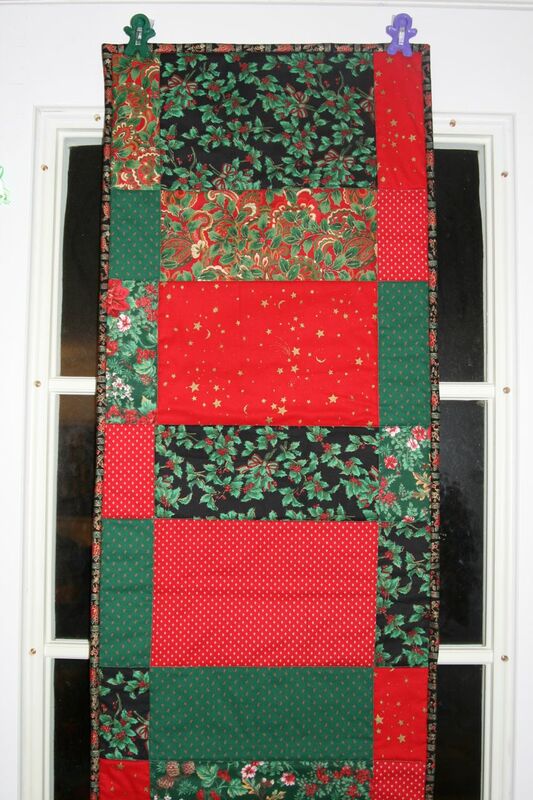 Looking at Amish quilts and Gee’s Bend quilts has given me a jolt in this direction. I’m finding I can’t get enough of those amazingly creative works of art. I’m coveting some Gee’s Bend books that I saw in my library – they are rife with ideas. 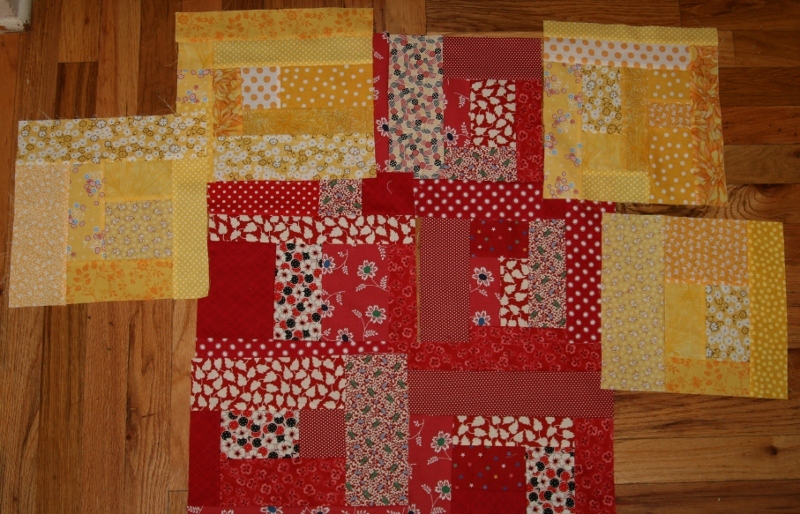 Another step on my journey: simple but powerful modern quilts that I can make quickly with high-contrast colors. Over the Thanksgiving weekend, I had a chance to visit the fantastic shop Back Porch Fabrics in Pacific Grove, California, which has a whole gallery of quilts along these lines. Inspiration is crawling all over the walls there! I only wish I lived closer, although that would clearly be dangerous to my wallet. Starting small in this direction, I tried the “Stack the Deck” technique, courtesy of quilting author Karla Alexander, where you stack up fabric, cut it, and then move a few pieces to the bottom of the deck. It seems like a fun and fast way to make a modern quilt. 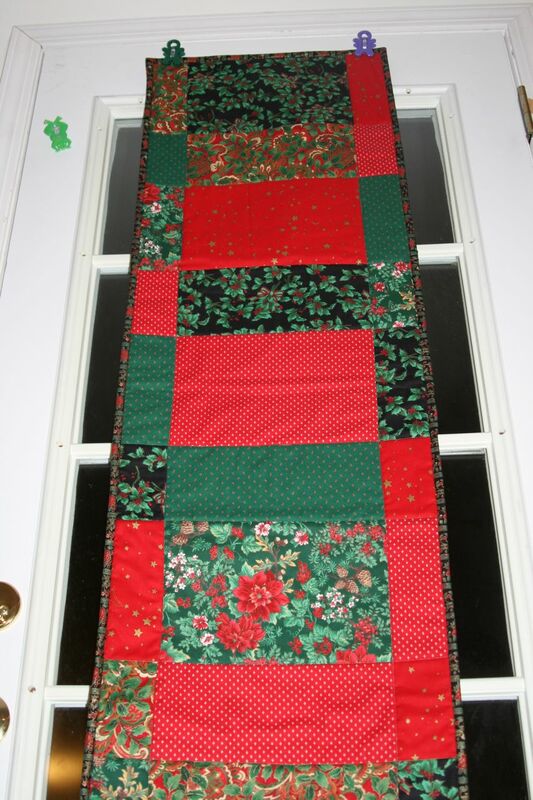 I used Stack the Deck to make this gift – a table runner in Christmas fabrics. I love the contrast of red and green. I didn’t quite use half green and half red, which might have made this look a little more “regular” looking. Instead I got funky. I hope this gift will be enjoyed!